My pieces are all individually made in sterling silver with 18 and/or 9 carat gold decoration. My range covers earrings, rings, bangles, necklaces, pendants, brooches and cufflinks. I also undertake a variety of commissions. I am particularly happy to design and make wedding rings, christening bangles and so on, and work with customers’ ideas to produce a personalised item. 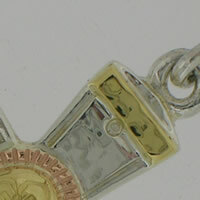 Engraving is also an option on most pieces. All pieces over 10mm width/length are hallmarked to sterling silver standards. All gold pieces are hallmarked according to the carat – whether 9, 18 or 22. This website displays a selection of my pieces from each category, and will be updated with new designs every few months. However I am happy to adapt the displayed designs and patterns to suit customer taste. For example, a shape from a pair of earrings can be made into a pendant, or a pattern on a bangle can be put on a ring and so on. For these orders, and any other type of commission, please go to commissions and ordering details. I was born in 1963 and grew up on the north-west coast of Scotland. After attending Dartington Hall School in Devon, where I got a good grounding in a range of Arts, I went on to complete a BA Hons in 3D Design at Middlesex University, specialising in silversmithing. The degree included an exchange with Bezalel College in Jerusalem. 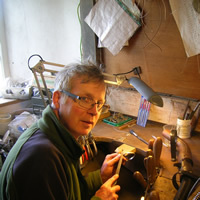 I then worked for a number of years with silversmiths and jewellers in London, Mexico and Canada, before setting up my own workshop in Devon in 1990. My work is a fusion of a variety of influences – particularly Celtic, Mexican and South American design traditions.